Plants can be just as baffling as children for those who’ve never cared for them before. New plant parents may find themselves wondering if their plant’s growth is normal or stunted. And questioning their abilities to give their plants what they need. Let’s look at some common growth questions so you can be the best plant parents ever. Your baby’s growing up and it’s time for a new pot. Generally speaking, you should give your plants a new pot and fresh soil every year. Choose a pot that’s one or two inches larger than the one it’s in. Make sure it has a drainage hole in the bottom and a saucer to put underneath the pot. You don’t want water marks to staining your furniture. Fresh soil is really important, think of it like the foundation of a house. Your plants health depends on the nutrients and soil structure of your potting soil. Espoma’s Organic Moisture Mix is the best all-purpose soil. If you happen to be repotting cactus or succulents, orchids or African Violets you’ll want to buy a special blend of soil that’s been created specifically for their special needs. Gently remove your little one from the pot, loosen the roots and shake off some of the old soil. You’ll want to plant it so that the old surface and the new surface are at the same height. Work in soil all around the sides so it feels solid and there aren’t any air bubbles. Some people like to top dress their plants with a decorative layer of moss or colored pebbles. Feel free to experiment and make it fit into your decor. Naturally, you’ll want to feed your babies the best food possible so, they’ll grow up big and strong. Feed them once a month with an all-purpose fertilizer like Organic Indoor! Houseplant Food. Always follow the directions, more isn’t better when it comes to plant food or people food for that matter. And, just like the soil some plants have special dietary needs like Cactus and succulents, orchids, and African Violets. Sometimes plants go through awkward stages. Their growth slows in winter and they may pout and look a bit lack luster. Summer light and warmer temperatures should cure that. Some plants get stretchy trying to reach out for the sun. Succulents that don’t get 4 to 6 hours of strong light per day are especially prone to this. Here is a video from Garden Answer to show you how to save your naughty succulent and propagate a bunch of new babies too. With its attractive leaves and low maintenance personality, pothos is one of the best houseplants for new plant parents to grow. Those with trailing vines, like golden pothos, love to fall over the sides of containers. It’s a fun plant to decorate with and a favorite of brown thumb gardeners because it likes low light and minimal watering. This is also one of the easiest plants to start propagating by cuttings. DIYers will love this trick for getting more pothos plants for free. If your pothos is getting a little leggy or you’re just looking for more plants, start with pothos. Step 1: Decide how much you want to cut from your plant. Make snips directly below the lowest leaf node. Nodes are those tiny brown bumps on the stem that are the key to growing new roots. Step 2: Make more cuttings. You’ll need a stem with at least two leaves to root your plant and you’ll want to remove the leaf that is closest to the stem. So clip vines into more cuttings, leaving at least one node on each. Your new roots will form from the node. Step 3: Place Cuttings in Water: Fill a small mason jar or other glass with water and place the cuttings into the water so the cut ends remain submerged. Place the cuttings indoors near a window, but not in direct sunlight. Check cuttings every few days and refresh water every 1 to 2 weeks. Step 4: Wait until your cuttings have at least one inch of roots to transplant. This should take about a month. If left in water, your pothos plant will continue to grow roots. The longer they grow in water, however, the harder it will be for them to transition to soil. Step 5: Pick a container with proper drainage holes and fill two-thirds of the way with Espoma’s Organic potting mix. Place the cuttings around the pot edges and add more soil to keep the cuttings in place. Add more cuttings to the middle and add soil as needed. Water your new pothos plant until water runs out of the bottom of the pot. Step 6: Place your new pothos in an area where it will get adequate light. Fertilize once a month with Espoma’s Indoor! liquid plant food for more growth. Looking for more easy care houseplants? Check out Garden Answer’s favorite low light houseplants! We all love ferns, they are a classic houseplant. Ferns come in all kinds of sizes, textures and colors. Yet as far as plants go, they can be fussy. Laura from Garden Answer has the scoop. If your fern is happy and healthy, great job! You can probably skip some of the topics toward the end. Now let’s take a look at your fern and double check it is living its best life. Contrary to popular belief, ferns need quite a bit of light. Though, they don’t like to be in direct sunlight as their foliage will change to a lighter yellow color or burn. Keep them near a place that receives plenty of sunshine throughout the day. Only few varieties can handle shade and moisture like most people think. Check your plant tag for the most accurate information for your fern. Ferns like their surroundings to be similar to what we like between 65 and 75°F, matching the temperatures in our home. They don’t like it too drafty so keep them away from doors that lead outside and away from air vents. This is the most important thing to be aware of for keeping your fern healthy, especially if you live in a dry climate. Placing your fern in a bathroom or kitchen near the water source can help, since they typically get more moisture in there naturally. For a more decorative option, place pebbles in tray with some water and place your fern on top. The moisture will carry up to the foliage as it evaporates. Add water to the tray as needed. Use Espoma’s Organic Potting Mix for your ferns. 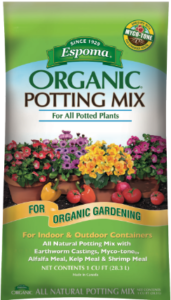 Organic potting mixes have the right kind of drainage, and will hold just enough water that is needed without drowning your fern. Typically, ferns need to be repotted every two years. Check its roots once a year. If the roots are starting to circle around the container, it is time to repot. If there is still soil around the edge of it, it should be fine for another year. When it is time to repot your fern, only go up one size for your container. Be sure there is a drainage hole at the bottom of your container. Place a small layer of Espoma’s Organic Potting Mix in the bottom and fill around the sides as needed. Ferns like to be consistently damp, but not wet and soggy like many people think. Each fern and home is a bit different, especially this time of year. Water your fern and keep an eye on it. If the soil at the top feels dry, water it again. Ferns like to be fed about once a month during their growing season. Each zone and climate will have a different growing season, which you can ask your local garden center about. Feed your fern with Espoma’s Organic’s Indoor! liquid plant food. Check the label for instructions on how to use. All houseplants should be groomed about once a month. Remove any foliage that looks damaged, unhealthy or is turning brown or yellow. Discard any leaves or debris that is on top of the soil to keep insects and disease at bay. The most common insects to watch out for are mealybugs, aphids, fungus mites, white fly and spider mites for just about any houseplant. If you are unsure of the insect you are dealing with, take a picture and take it to your local garden center. They will be able to offer suggestions on how to get rid of it. Ferns are non-toxic, but it is still a smart idea to keep your pets and kids away from eating or playing with a fern. That might just cause a tummy ache or a mess in your home! Drop any other questions below in the comments and we will help you out the best we can! Did you know houseplants can communicate? We talk to our house plants in hopes they can tell us what’s wrong. Thankfully, plants communicate with us all the time. If your plants’ leaves are wilting, they’re saying “Please water me.” Yellow leaves are saying “Hold off on the water. You’re killing me with kindness.” Let’s look at a few things your plants are trying to tell you. No one likes stress, not even plants. A common sign your plant is stressed is if it’s dropping leaves and flowers. Stressors can include lack of water, over watering, temperature change, less light – you name it. If the problem isn’t too little or too much water, or something else easy to identify, have patience. The plant will likely adapt to its new situation. Wilting is usually a sign that your plant needs water. Some plants, like peace lilies, wilt so terribly you’d think it was dead. But don’t worry, it’s just being dramatic and will perk up after a good watering. We’re not talking about yoga here. In the plant world that means long and spindly stems. The plants are literally stretching themselves toward the light. Sometimes older leaves will fall off. Check on your plants requirements — chances are it just needs more light. It could also mean that your plant needs pinching. It’s not mean, it’s kind of like pruning. Pinching off the top inch of your plant’s stem will encourage it to grow laterally and become fuller and more beautiful. Pinching off spent flowers is a good idea that will help your plant save energy, too. Have you noticed some white stuff on the side of your clay pots? As you water and fertilize your plants, salts and other minerals can build up. It may cause the foliage tips to turn yellow or brown. Watering your plants in the sink and allowing the water to run through a few a few times helps flush then out. You can use a scrubbing pad on the outside of the pot. Repot regularly. Leaves get brown tips because water isn’t reaching that far. Too little water or too much fertilizer is usually to blame. Make sure you’re watering consistently. Use Espoma’s Indoor! House Plant Food for its slow release formula to ensure your plant isn’t being overfed. Always follow the package directions as more is not better. Do you remember the last time you repotted it? If you can’t, maybe it’s time for fresh soil and bigger pot. Think your houseplants need some extra space? Check out this video about repotting house plants. Orchids are the perfect way to introduce a stunning houseplant into your home. They bloom for up to four months, which make them the perfect plant to add some color and flair to any home. They love indirect light, a little bit of water and to be away from any drafty windows, air vents or ducts. Plus, they will continue to rebloom every year with a little love and patience and fertilizer. An organic fertilizer, such as Espoma’s Orchid! liquid plant food, will help keep your blooms looking fresh and colorful year after year. There is a HUGE variety to choose from, all in different sizes, colors and fragrances so you can find one that you absolutely love. Not sure where to start? Don’t worry; we’ve collected our favorite show stopping orchids for you. This flat-faced flower is one of the friendliest looking orchids you can choose. They bloom early in the spring and, in some varieties, will bloom again in the fall. Producing up to 10 flowers, each growing 4 inches across, this orchid will provide a stunning display. Mist weekly with water to give it the moisture it needs. Growing best in filtered light, this orchid has small, but striking chocolate-colored petals. Unlike typical orchids, its flowering stalks will reach lengths up to four feet. Fertilizing regularly will encourage growth. Mist it lightly once a week to keep moderate humidity. Its blooms look like butterflies and it’ll look great individually, but is stunning en masse. Gather a few different colors and textures and have every houseguest talking. They love bright, indirect sunlight, so near a window with a sheer curtain would make them happiest. Coming in dozens of varieties, you can really play around with color combinations. Small enough to place anywhere in the home, we even recommend placing one a bathroom sink. It is beautiful from all angles, so mirrors can be beneficial. Plus, it enjoys low light with lots of humidity. After watering, be sure you allow it to drain completely. This orchid thrives off a barky soil, so be sure to use Espoma Organic’s Orchid Mix, as it will wilt in regular potting soil. It is a light lover, so keep it near a window, but out of direct sun. It is happy in the same temperature as your home, around 65-75 degrees. Laura from Garden Answer shows us the basics of caring for orchids. Monstera is commonly called Swiss cheese plant or split-leaf philodendron referring to the beautifully cut leaves. It’s a must have for its Caribbean feel. The foliage is deep green, lush and tropical. With time the foliage can become quite large and exotic looking. There is also a rare white variegated form that is slower growing. They generally don’t bloom indoors but in its natural environment they will produce edible fruit that is said to taste like fruit salad. As a tropical plant it’s no surprise that your Monstera likes warm indoor temperatures between 68 and 86 degrees Fahrenheit. A little humidity makes them feel right at home, too. Bathrooms and kitchens can often supply a touch of humidity or you can simply mist your plant now and then. These plants grow naturally in the dappled light of the forest floor. To mimic that, place your Monstera in bright or filtered, indirect light. They can actually grow in deep shade, but may not exhibit as much of the cut leaf foliage. If you live in zones 10 or 11, you can grow it outdoors in a shady spot. Monstera likes moist soil, but not one that stays soggy or overly wet. Make sure the pot has good drainage. Water weekly, when the top inch of the soil is dry. Make sure any excess water drains away. In spring and summer, when the plants are actively growing, it’s a good idea to feed them once a month with a liquid fertilizer like Espoma’s Organic Indoor! plant food. Repot young plants every year to encourage growth and add soil nutrients. Gradually go up in pot size by 2 inches per year. Once your plant has reached its optimal height for your space, you can give it a top dressing of new soil once a year and only repot it about every 3 years. Always use a quality potting soil to help keep the soil moist but free-draining. These are natural climbers that use their aerial roots to hold on to trees. When you do repot your plant, be sure to add a trellis or moss covered plant stake for support. Young plants often have compact, bushy habits. As they grow, they will begin to show their vining nature. You can either give them support to climb and become a tall and dramatic or if you prefer, you can pinch them to rein in the lankiness. Pinch off the new growth tip with your finger at the height you’d like it to stay at. Feel free to prune out stems that are producing few or no leaves. If you can’t tuck the aerial roots back into the pot, you may remove them as well. Monstera is rarely bothered by pest or disease. Wipe off the leaves with a damp cloth from time to time or give it a shower to remove dust. Check for spider mites when you do. This is a long-lived house plant that will give you years of pleasure with little care. Ready for more houseplants? Check out Garden Answer’s Top 5 Low Light House Plants. Welcome to Plant Parenthood, a reoccurring series helping you with all things houseplant! As plant people ourselves, we are so happy to see you here. This will be your resource to get you started, to teach you how to care, when to fertilize and much more. Some of you may already have a houseplant or two, which is wonderful. If you are starting from scratch, below are some great houseplants to get you started. They are easy-to-grow and require little maintenance. Before getting started think about your lifestyle and what chores you want your houseplant to do. Do you want them to clean the air, just sit around and look pretty or maybe both! Also, think about how much light your space gets, as some houseplants love bright light while others thrive in little to low light. This tried and true classic is getting more and more popular. Peperomia is compact, so you don’t need a lot of space for it. But don’t let the size fool you, it’s variegated and colorful foliage can pack a punch. Keep your plant near a window, as it likes medium to bright light. Water it when the top two inches of soil are dry, though it can go a bit without water and still be fine. It will not grow quickly, however use Espoma’s Indoor! liquid plant food to give it the nutrients it needs to thrive. Dracaena will need a new home as it ages. When it is young, it is perfect for a tabletop or desk, as it is a little bushy plant. Though, it can grow 5 to 6 feet tall as an adult. Depending on the variety you choose, its foliage can look like little bursts of stars or fireworks on the tips. It adds dramatic texture to any room. Place it where it looks best in your home – it is not picky about how much light it gets. Water it when the top of the soil dries out. This tough houseplant can survive even with the brownest of thumbs. You can put it anywhere in your home or office and it will be happy to see you. It can even survive with only florescent lights and no natural light. Water when the top two inches of soil are dry. Don’t worry if you forget, it may start to drop some of its leaflets to conserve the water left and will rebloom after a good drink. Also known as the Chinese evergreen, this houseplant is stunning. It can come in colors from deep green to silver to red. It is slow growing, with large, narrow and glossy oval foliage. When deciding where to put Aglaonema, keep in mind the lighter the variegation, the more light it needs. So if you opt out for dark green foliage, it can thrive in low light. Water when the top two inches of soil is dry and add humidity around the plant in the summertime. Use Espoma’s indoor! liquid plant food during the growing season to give it the nutrients it needs. Have fun with pothos as you can grow it in a hanging basket to allow the foliage to trail down, trellis it up or allow it to grow horizontally across a shelf or on a cabinet. It has a beautiful green foliage with specks of white, yellow or cream mixed in. It can grow in any kind of light, with low humidity. Keep the soil moist, so water it when the top inch of the soil is dry. Laura from Garden Answer shows off some low light houseplants that are perfect for anyone looking to get started. Spend winter months brushing up on your plant knowledge and cozying up indoors with a book on plants. The options can be endless and there’s certainly something for every level of gardener. Explore a whole new world of plants with our recommendations below. From the basics of horticulture to detailed information about what type of plant will thrive in your living space, How Not To Kill Your Houseplant will be your comprehensive guide. This book covers 50 popular house plants and teaches you how to look for warning signs of sickness, pests and disease. With helpful tips, pictures and informational panels How Not To Kill Your Houseplant will help you create a plant paradise right in your own home. Homestead Brooklyn shows you how to fertilize your houseplants. This book will inspire beginners as well as advanced plant parents. It goes beyond the basic of plant care into the art of styling your home with plants. Travel across Europe to 5 different green homes with urban jungle bloggers, Igor and Judith. Along with style tips you’ll find DIY ideas with step-by-step instructions along with beautiful photography. Take your design skills to the next level and create and care for your own urban jungle. Growing under indoor lights opens up a whole new world of possibilities for home growers. Gardening Under lights is a complete guide to high tech growing. It explains the basics and gives an overview of the most up-to-date tools and gear available. It also offers tips and techniques for growing ornamentals like orchids and bonsai, to growing a whole range of edibles from arugula to zucchini. There is also a complete guide to starting seed indoors. New to seed starting? Watch this video to get up to speed. A follow up to their successful debut book House of Plants, Caro and Rose show how easy it is to propagate house plants at home in their stylish new book. Beginner friendly techniques such as stem cutting, rooting in water, runners, offsets, grafting, and division are all covered. It also includes DIY projects like seed-bombs and how to make self-watering plant pots. Find out how fun and easy it is to create new plants for meaningful gifts and displays. Here’s how to propagate the hottest houseplant. While this might not be new, The Savage Garden is still the best-selling book for anyone interested in carnivorous plants. The new edition is fully revised to include the latest developments and discoveries in the carnivorous plant world, making it the most accurate and up-to-date book of its kind. Beautifully illustrated with over 200 color photographs, let this be your guide to the beautiful, unusual world of easy to grow savage plants. The Houseplant Masterclass is the first comprehensive online audiovisual course on houseplant cultivation, care and maintenance taught by Summer Rayne Oakes, founder of the blog, HomesteadBrooklyn.com, the weekly web series Plant One On Me, and author of the forthcoming book, How to Make a Plant Love You (Optimism Press, July 2019). The course was fully funded on Kickstarter in April 2018 and went on sale in December 2018. The Masterclass features five sections and 100+ sub-sections on houseplant growing, care and cultivation; over 4 hours of audiovisual recordings; 300 full-color images and charts; a comprehensive care spreadsheet of 300+ common houseplants; 100+ botanical terms and 350+ botanical Latin names; product and book recommendations; access to a private Facebook community; and more. Participants will get houseplant badges as they complete sections and a certificate of completion at the end of the course. Want to learn the basics of one of the most common houseplants? Summer Rayne teaches us all about Pilea Peperomioides. Growing bromeliads indoors is a wonderful way to welcome vibrant colors and live foliage into your space. While they have a reputation for being difficult to grow, they are just different than the average houseplant. They are adaptable to their surroundings, low maintenance and offer long-lasting blooms. Bromeliads that grow in soil are best to use as houseplants. There are four varieties that are best for bringing indoors: Billbergia, Cryptanthus, Guzmania, and Neoregelia. These are most recognizable for their spikey blooms and can be solid in color or have a variegated stripe to them. Each variety grown indoors likes their light a bit different. Generally placing them in bright, indirect light is fine, but be sure to check plant tags as some prefer shaded areas. Bromeliads should be potted at the base of leaves to give the roots enough to secure it to the soil. A 4-6 inch pot is a great starter, but keep an eye on your plant and place it in a bigger container if it begins to lean or fall over. Use a barky, airy, well-draining soil, such as Espoma’s Orchid Mix for orchids and bromeliads. Potted bromeliads adjust to the temperature around them. They are happy in the temperature you keep your home – anywhere from 35 degrees to 95 degrees. When the temperature increases, increase the humidity around your plant by misting water or using a pebble plant tray. Like most plants, you should keep them away from heating and air vents so they don’t dry out. Use a slow release fertilizer, such as Espoma’s Indoor! liquid fertilizer once a month. Simply mix it in with your watering can and follow the instructions on the bottle. Already have a bromeliad that needs more room? Watch Summer Rayne repot her bromeliad. Every room in your house looks cozier and more beautiful filled with houseplants. It’s especially true of your bathroom. Who wouldn’t want a lush, tropical, spa feel at home? In fact, your bathroom is perfect for tropical plants because they love a humid environment. Research shows that having plants around makes people feel calm, happy, and relaxed. Making them perfect for some spa time. And some houseplants actually purify the air. Ivy can remove 75% of mold spores in a room, which is important if you have allergies. Plants can pull dust from the air to help you breathe easier. Not sure about the bathroom spa? Find out which plants thrive in your bedroom, living room and kitchen. Nerve plants have colorful foliage that’s so attractive they don’t need flowers. Try adding one to a shelf, the corner of the counter or even hanging from a hook. Nerve plants grow best in medium to low light. If you have sheer curtains you could even grow them in full sun. Water when the surface of the soil is just starting to dry out. They like moist soil but not too wet. Feed them on a monthly basis with Indoor! liquid plant food to keep them healthy. If you are lucky enough to have a lot of space in your bathroom but not a lot of light, you can go large and tropical. Try this easy to grow Jungle Queen. The more it grows, the more spectacular it becomes. It tolerates low light but will grow faster and larger with more direct sunlight. Water regularly to keep the soil evenly moist and feed once a month with Indoor! liquid plant food. Moth orchids have long, thin stems and large flowers that create a big impact in small places. They flower for an incredibly long time. If you have the room, arrange a small group of them for a sophisticated look. These are the easiest orchids to grow, even if you are a beginner. Water well once a week, then let them drain completely. Feed regularly with Orchid! liquid plant food. Majesty palms are the quintessential tropical plant. If you have room for one of these, it will transform your bathroom into an oasis. They thrive in the humidity and like to be kept evenly moist. Fertilize regularly with Indoor! Liquid plant food for faster growth. These are easy palms to grow and don’t require any pruning except for an occasional old frond. Is there low light in your home? Laura from Garden Answer tells us about low light houseplants that you need to bring home.